Powers: Like all members of his team he is outfitted with a device which grants him access to a finite set of powers but he can only access one power at a time. He’s displayed flight, Shields, teleportation etc. 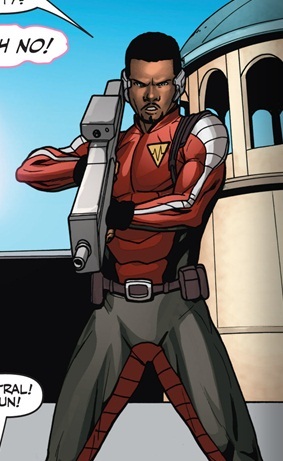 Shakespeare is a member of the H.A.R.D Corps (Harbinger Active Resistance Division) created by the Rising Spirit, a rival company to the Harbinger Foundation. Their sole purpose is to hunt down and if necessary neutralize escaped or renegade psiots/Harbingers. During The Harbinger wars he killed a few Psiots before being killed by friendly fire. NB: In the original Valiant comics there was a white character also known as Shakespeare who was a member of the H.A.R.D Corps.